Or you can whip red wine, sugar and cream together, place in glass and over time the wine will drop to the bottom and the cream is pink. Various recipes in Raffald's The Experienced English Housekeeper suggested letting the syllabub set overnight or several days in a cool place: "...put it into glasses the night before you want it: it is better for standing two or three days, but it will keep a week, if required." The time would help with the liquid in the bottom, so "let them stand all night, and they will be clear at the bottom" and then "send them to the table upon a salver, with jellies." She felt it was important to keep removing the frothed whipped cream as it rose "take it off with a spoon as it rises, or it will make it heavy." 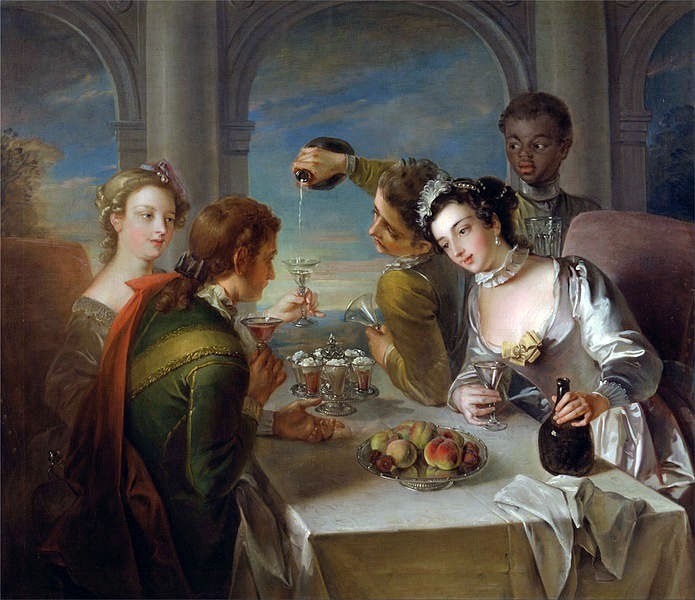 Different countries preferred different drinks to make syllabub according to an 1827 book. "Almost every county has its syllabub, and the only difference among them is, some use port entirely, others cider and brandy, some strong ale and home-made wine." [Domestic Economy, and Cookery... London: 1827] However most of the alcohols can be found in British receipts. Take a pint of thin cream, rub a lump of loaf sugar on the outside of a lemon, and sweeten it to your taste, then put in the juice of a lemon, and a glass of Madeira wine, or French brandy, mill it to a froth with a chocolate mill, and take it off as it rises, and lay it upon a hair sieve, then fill one half of your posset glasses a little more than half full of white wine, and the other half of your glasses a little more than half full of red wine, then lay on your froth as high as you can, but observe that it is well drained on your sieve, or it will mix with your wine and spoil your syllabubs. Take a quart of rich cream, and put in a pint of white wine, the juice of four lemons and sugar to your taste whip it up very well, and take off the froth as it rises, put it upon a hair sieve, and let it stand till the next day in a cool place, fill your glasses better than half full with the thin, then put on the froth, and heap it as high as you can; the bottom will look clear, and keep several days. Sift half a pound of double-refined sugar into five gills of cream, half a pint of nice sweet wine, the juice of two large or three small Seville oranges, the zest of two lemons zested with sugar, and a spoonful of orange-flowerwater; mill it with a chocolate miller, and dress it into glasses. Put three wineglassfuls of the [strawberry] juice to ten ounces of white sugar; add the juice of a lemon, and a pint and a half of cream. Froth the cream in a syllabub-churn, and remove the froth as it rises, and put into glasses. Next week's post will be making syllabub under a cow - 1870s recipe and one from 100 years earlier - or if no cow available, using a table or syringe. Cider, beer or wine.. have to admit I've never tried it.